Based on Yan Geling's (praised as one of the finest writer on and of Chinese immigrants) book of the same name, with a dependent crew of Ang Lee regulars such as writer James Schamus on board, Sylvia Chang's 7th feature would somewhat represent a foreign language venture. Standing firmly with one foot still in Asia, her challenge still lies in directing in English and name talent like Daniel J. Travanti (Hill Street Blues). Knowing Chang's splendid skills in English language anyway, it doesn't come as a surprise that the Asian and Western cast gel in her hands. Plus, Siao Yu represents felt, poignant simplicity done well. Despite being the umpteenth immigrant or green card movie made in Asia or produced elsewhere, Farewell China, An Autumn's Tale or The Illegal Immigrant all stand on their own feet. As does Siao Yu. Focusing on a meeting of minds, meeting from different worlds and turning points in different stages of life, much could've gone the pretentious route in Chang's frame had it not been for a straight, natural stance towards the material. She presents quite a cycle of emotions and character facets for the leads, especially in regards to Travanti's Mario. Once a fighter against the unjust treatment in this world, be it in regards to war or the poultry industry, here you find a man who is carrying aggressions more against his nation than any racist veins in his body. Being sarcastic about it all, bitter, these are elements vaporized in the face of youthful innocence, i.e. Siao Yu. A rapport that structures itself around an awakening speaking to notions of independence and clearing out of your old devils. It's no use covering Sylvia Chang's terrific direction in several paragraphs because she does the very correct thing of distancing herself from the frame in order to let her actors decorate the natural surroundings their characters are in. Quite a stage-bound flick therefore, it's nonetheless a joy to see actors talk and interact this way with each other, while we still feel every ounce of the theme running through the film. Never employing obvious plot devices that threatens to derail the lick into court-drama or even thriller-territory (as jealousy is part of the story, that was indeed a threat lurking), Chang just continues to smoothly inject building block after building block in Siao Yu and Mario's relationship. What's continually fascinating is that he has a tuned radar to Siao Yu's plight, which leads to the writer's best line about her "fighting in a way you and I can't notice". Fighting her way through what pretty obviously is a romance based on male dominance, growing into an independent woman and all requisite treats of the character-drama that rarely pushes too hard or too soft. Tuned. 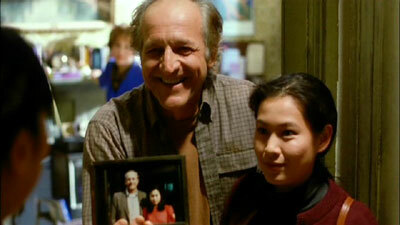 Tuned being applicable to the performances by Rene Liu and Daniel J. Travanti as well. She is perfect as the big question mark in terms of how unfamiliar she is with her surroundings, the forced acquaintance with a Westerner/old geezer but Liu isn't allowed to make that her only acting trick. Slowly, surely, with a splendid subtle touch, she invests Siao Yu with what's required, be it her in love, in doubt and in learning. Travanti is wonderfully understated, making use of verbal-free tangents such as him transforming into a more clean man for one. With his various sarcastic outbursts, he shows a mastery in flowing dialogue with just the right inflictions for the character. His rapport with Liu is a centerpiece to the film that never fails. It's all due to the voice of Sylvia Chang probably, at its very peak as far as I'm concerned. While Princess-D subsequently showed her experimenting with visuals, there never grew a director out of Chang that relied on cheap gimmicks. With layered writing, hands-off direction is the only logical choice and to nail that, you also need a grip on the West meets East factor (including directing foreign dialogue). Why that fully succeeds in this green-card drama is due to Chang choosing to stand firm on home ground, never letting herself be fully exported. Mei Ah presents the film in as aspect ratio of 1.78:1, with anamorphic enhancement. Showcasing mild wear at times as well as an unstable frame, largely the presentation is quite sharp and in tune with the colour-design of the film. The English/Mandarin (with slight Cantonese) dialogue track is presented in Dolby Digital 2.0. Early on the track varies in clarity but soon settles for an even, clear sounding experience that stays center-based all throughout. The English subtitles stay on for all dialogue, including English, but are on the whole quite flawless. A select few English exchanges doesn't fully match up as written in the subs but it's not a distraction. Traditional and simplified Chinese subtitles are also available. Mei Ah's Databank graces the disc in terms of extras but seeing it has nothing, it gets the verdict of nothing too.